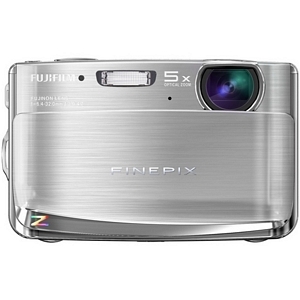 The Fujifilm FinePix Z70 is a low-cost point and shoot digicam, in many ways comparable with other point and shoot digicams' feature sets. It offers relatively low image quality and a handful of features intended for consumer use to automate image uploading processes. The camera measures 3.6" by 2.2" by .8" and weighs 4.4 ounces, making it small and compact enough to fit it in a pocket or to move it in its own case. The camera captures images at a resolution of 12.2 megapixels using a 1/2.3" CCD, which it stores in 13MB of internal memory or to either SD or SDHC memory cards. It captures images in JPEG (compressed via Exif 2.2), AVI (containing motion JPEG), and WAVE format audio and monaural sound. It captures images at many resolutions based on aspect ratio: 4000 by 3000 (12M), 3984 by 2656 (10M, 3:2), 4000 by 2248 (9M, 16:9), 2816 by 2112 (6M), 2048 by 1536 (3M), 1920 by 1080 (2M, 16:9), 1600 by 1200 (2M), and 640 by 480 (0.3M). Videos can be captured at 320 by 240 or 640 by 480 in standard definition or 1280 by 720 in high definition. The camera has an optical zoom lens up to 5x with a range between F4.0 in Wide and F4.8 in Telephoto. The lens has a focal length of f=6.4 - 32mm, equivalent to a 35mm camera with a range between 36 and 180mm. The camera can be set to both Normal and Macro; in Normal, its focus distance is between 2' and infinity in Wide and 3.3' and infinity in Telephoto, and in Macro, its distance is between .5" and 2.6' in Wide and 3.3' and 9.8' in Telephoto. The camera's sensitivity can be set automatically, but can also be set to ISO equivalents of 100, 200, 400, 800, and 1600. 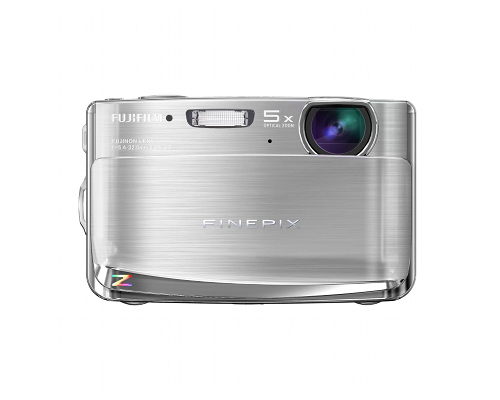 It offers 256-zone metering using TTL exposure control and has a programmed auto exposure. The camera's shooting modes can be set to Natural Light, Natural Light & with Flash, Portrait, Landscape, Sport, Night, Beach, Snow, Sunset, Party, Museum, Flower, Text, Digital Image Stabilization, Auction, Successive Movie, SR AUTO (Scene Recognition Auto), Auto, Program, Night (Tripod), and Portrait enhancer. The camera has a digital image stabilizer. Its shutter speed moves between 1/2000 and 1/4 of a second and its focus can be set to auto focus, TTL contrast autofocus, and tracking autofocus. The camera's white balance can be set to Auto, Fine, Shade, Fluorescent light (Daylight), Fluorescent light (Warm White), Fluorescent light (Cool White), and Incandescent light. The camera includes a self-timer that can be set on a 2-10 second delay, a couple timer, or a group timer. The camera has an auto flash with effective ranges in Normal and Macro. In Normal, the flash's range is between 2.3' and 10.2' in Wide and 2.3' and 8.9' in Telephoto, and in Macro, the flash has a range of 1 to 2.6'. Included flash modes are automatic, red-eye reduction, forced flash, suppressed flash, and slow synchro. The camera has a one-button upload system, making it possible to directly upload images and videos to YouTube and Facebook. It also allows for in-camera editing of videos and still images, with playback options including Face Detection, EDIT FOR BLOG, Image Search, Crop, Image rotate, Slideshow, Multi-frame playback (2/5/9/100 frames), Sorting by date, and Voice Memos. The camera has a 2.7" LCD measuring 230000 dots with approximately 96% frame coverage. The camera has a USB 2.0 port and a video output that can be configured to be output in either NTSC or PAL, making it possible to connect the camera to most televisions. The camera has a lithium-ion battery that charges externally. The camera has a lengthy (3-4 second) start up time. The camera has issues with image blurring in certain light settings when using automatic configurations. 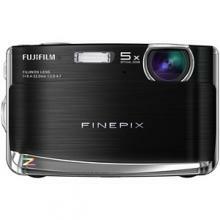 Review it: "Fujifilm FinePix Z70 "
The camera offers few accessories, such as an AC adapter, an external battery charger, A/V cables, and the FinePix HD player, which connects SD media to HD output.